What you see is the W33 nebula. 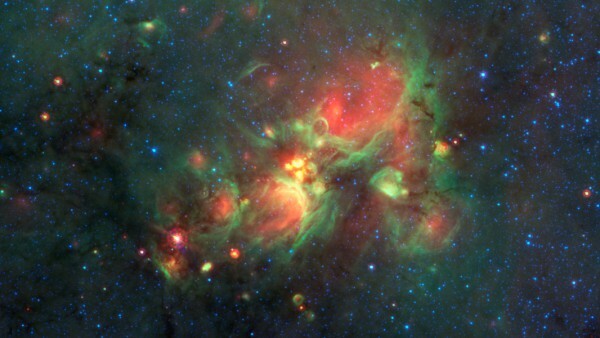 A newly formed nebula whose most notable thing are these yellow balls. The W33 is a region of star formation about 13mil light years from here a little above the plane of the Milky Way. That is, it looks similar to our angular momentum. But what is important, what are these yellow lights ?. For it is nothing but hot gas by gravity, come on, the basis of formation of new stars. Hydrogen warm by the gravitational pull. As shown, there are around green and red colors, bubbles. Gas also remains, but less hot. In fact, the central bubbles are yellow because they are binding on those colors there than the surrounding gas is also … stardust lifetime, come on. An image to remember because in a few thousand years, there will be stars.